The United Nations’ 2030 Agenda for Sustainable Development, comprised of 17 goals and 169 targets and monitored by 232 indicators that encompass economic, social, and environmental domains, presents a major challenge to national and international statistical systems. At every stage of the data value chain — collection, production, uptake and impact — the Sustainable Development Goals (SDGs) will require innovation, cooperation, and additional financing. Previous studies have estimated the costs of meeting the data demands of the SDGs. And while those studies provided a useful baseline for the costs of financing the SDGs, the funding environment has changed. We have gained a better understanding of the required methodologies for indicators and the costs, technological advancements and efficiency gains associated with data collection instruments. This concept note reviews two options for updating the previous cost estimates: a light-touch update and a full-scale recalculation. Both options focus mainly on the first stages on the data value chain, specifically collection and publication. Building on previous estimates, either option – light-touch or full-scale – should produce more refined estimates for the costs for monitoring the SDGs, the level of funding needed from donors, and consequently, a new estimate of the funding gap. While an update to the funding gap estimate may produce a more accurate figure, a critical question remains of whether such an update is necessary or politically prudent. 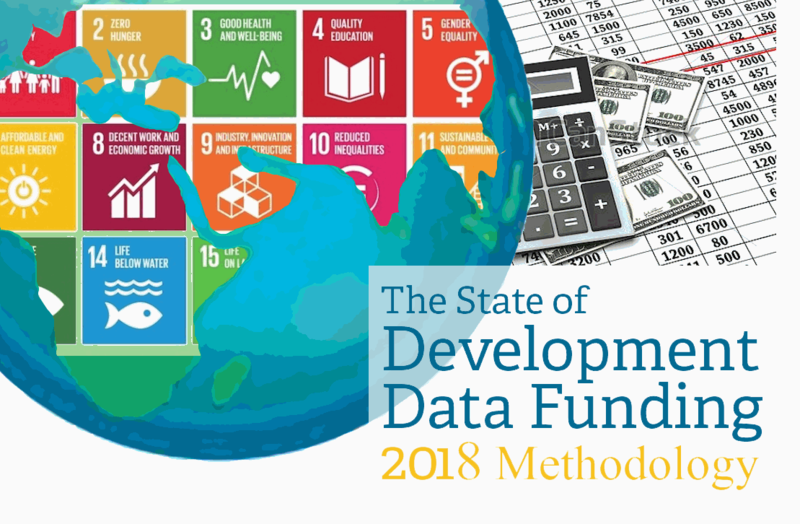 The last update (the 2016 State of Development Data Funding) was finished only two years ago and the release of a new update may cloud the discussion if people argue over methodology rather than focus on methods for increasing funding. This concept note, prepared in in collaboration with the Global Partnership for Sustainable Development Data’s Financing for Data Expert Group, will help decision makers make an informed decision about the options available for updating the cost estimate. In 2015, the Sustainable Development Solutions Network, Open Data Watch, PARIS21, the World Bank, and other organizations collaborated to develop an estimate of the financing required to monitor the SDGs. The report, Data for Development: A Needs Assessment — henceforth D4D — sought to produce an aggregate figure for the cost of producing the statistics required for monitoring the SDGs in 77 countries eligible for grants or credits from the International Development Association (IDA). D4D estimated the costs based on eight categories of statistical activity: 1) national survey programs (household (DHS, MICS, LSMS, LFS, other); 2) census; 3) civil registration and vital statistics; 4) administrative data (using cost estimates from education management information systems); 5) industrial establishment surveys; 6) improved real sector statistics; 7) geospatial information systems; 8) environmental monitoring. Building on the work of D4D, the State of Development Data Funding (SDDF) report updated estimates for the cost of producing the final set of SDG indicators agreed on by the Inter-Agency Expert Group on SDG Indicators (IAEG-SDGs). It went beyond the 77 IDA countries in the earlier study to include estimates for 67 lower- and upper middle-income countries that may require limited development assistance to fund the production of their SDG indicators. The study focused exclusively on the Tier I and Tier II SDG indicators for which there are existing data or known collection methodologies; it did not estimate the resources needed to develop methodologies and collect data for indicators classified by the IAEG-SDGs as Tier III. The cost estimates were compared with funding information from a variety of sources to estimate the gap between funding and costs. For external funding, the PRESS reports by PARIS21 were analyzed to ascertain the funding amount dedicated to statistics by OECD Development Assistance members, international financial institutions, and other non-DAC donors. Survey results from the Aid for Statistics report were used to estimate funding from multilateral donors and private foundations. To analyze domestic funding, the budgetary breakdowns between domestic and international funding for statistics in national strategies for the development of statistics (NSDSs) were recorded to create the domestic resource mobilization ratio. The combination of external and internal funding for statistics was then summed to create an estimate of the total funding for statistics. The total cost was then subtracted from this figure to create an estimate of the funding gap. Some of the cost estimates may have been updated by agencies who provided them or some of the assumptions made need to be reviewed again. More information is now available on the sources of SDG data and recommended methodologies. It is, therefore, important to revisit the previous cost estimates, taking into account new research and information. We outline the proposed updating methodology in two parts, starting with a light-touch update leading to a full, comprehensive update. We conclude with a discussion of the reasons for conducting an update and the impact a new funding figure may yield. The first step is to update the list of low- and middle-income countries included in the previous estimate to recalculate costs and the level of funding needed for statistics. The previous study included estimates for the financing needs of 77 IDA-eligible countries as well as 67 lower- and upper-middle-income countries. Since then some countries have graduated from the original list of 77 IDA-eligible or ‘blend’ countries that were selected as in need of external assistance for funding for development data and will need to be reviewed. Currently, there are 75 IDA-eligible countries and 65 lower- and upper middle-income countries. These changes will be taken into account in a light update. The same data categories and instruments for SDG monitoring would be used for the light-touch update, however, because the costs of data collection may have changed since the last update due to technological advances or changes in methodologies, they will need to be updated. Experts will be interviewed and some estimates will be rederived after reviewing updated background documents to see if any of the major costs for instruments has drastically changed. The light touch could recompute costs for population sensitive estimates, specifically censuses and civil registration and vital statistics (CRVS). The original population estimates used to cost the censuses in the D4D and SDDF were from a 2013 population figure. This update could rederive census costs using population projection numbers for mid-year 2023 – the halfway point for the SDGs. The update would also review the population assumptions for other data categories, such as CRVS and national surveys, and revalue cost estimates. This will provide a more accurate picture of the population that will be surveyed in a census, or other population-based instruments, for the selected countries between 2015 and 2030, as it will factor in population growth to the estimate. The number of censuses performed since 2015 and progress made towards the 2020 census round will be analyzed to check the assumptions from previous reports of census frequency, the number of censuses actually implemented, and reanalyze the costs of the census based on the new population figures. As the technology for delivering a census has advanced, the costs for doing so may have changed as well. New estimates should consider the onset of technologies such as computer-assisted personal interviewing (CAPI) which may decrease census costs over time. Regarding CRVS systems, costs may also have changed since the implementation of unique ID systems and biometric systems. Likewise for environmental monitoring, it will be important to take into account more frequent, low-cost, high-resolution satellite imagery and ongoing efforts to make that imagery freely available (for example, using Radiant). Relevant experts will be interviewed and influential reports will be reviewed to verify this cost. Estimates of the levels of external funding currently provided for statistical programs are derived from the PARIS21 PRESS report. The new PRESS 2017 figures will be used to update the available funding – committed or disbursed – for statistics. If only a light update is being performed, then the total costs for the instruments needed in the selected countries to measure the SDGs will be subtracted from the updated funding estimates to measure the gap between the two. If a more rigorous approach is taken, then the updating will move into a full update, and the gap analysis will be performed later. All the estimates from the light update will be included in a full update. Regarding country coverage, after revising the number of IDA-eligible countries in the light update, the full update will review country selection criteria to include other important factors: statistical capacity indicators, income levels, capacity for self-funding, and other criteria relevant to statistical funding. The original analysis assumed that relative poverty (or IDA eligibility) was the most important indicator of the need for external assistance, but there is variation between IDA countries and other factors may be important to understanding the need for assistance. Since the release of the SDDF figures, the tier classification and methodologies for SDG indicators has continued to be revised. Because some indicators have moved from Tier I or II to Tier III, or vice versa, an updated mapping of the indicators would be useful. The Tier I and Tier II SDG indicators will be remapped to methodologies and data instruments adopted at the last meeting of the Inter-Agency and Expert Group on SDG Indicators (IAEG-SDG) in April of 2018, or to the most recent IAEG-SDG meeting documents at the time of the update. If necessary, indicators that do not map to existing data instruments will be mapped to additional instruments and custodian agencies. A survey of custodian agencies will also be conducted to cost new methodologies and instruments as well updates to costs of current instruments. While the light-touch update focuses on PRESS 2017 figures, the full update will also recalculate the Aid for Statistics’ figures and reevaluate the domestic versus international resource mobilization ratio. A survey will be sent to private foundations and multilateral donors, as was done in 2015, to determine the new level of financing for statistics from these funding sources. These figures are not included in the PRESS 2017 report and will provide a more complete picture of the funding landscape for statistics. Since the SDDF report was published, new national strategies for the development of statistics (NSDSs) have been published which may report a higher domestic resource mobilization ratio for funding for statistics. If there is a significant number of new NSDSs — with a sufficiently detailed budgetary breakdown — then this information should be collected to create a new ratio of international versus domestic resource mobilization. Once the full update is finished, the gap analysis will be performed in the same way as it was in the light touch update. The methodological options presented in this concept note describe the process by which a light-touch or full update could be done. Updated cost estimates for the implementation of the SDGs would provide a better understanding of the funding gap for development data. Not included are the costs associated with institutional reform, training, and other aspects of capacity development more closely associated with the dissemination and uptake stages of the data value chain. A complete picture would also include the investments needed in the international statistical system to facilitate interoperability across countries and data domains. These could be included in an expanded costing study, but are, perhaps, best approached incrementally. In the meanwhile, the political considerations and the reception that a new estimate may receive should be weighed against the value of an improved estimate. Important stakeholders and experts should be convened to discuss the best path forward. This concept note is intended to serve as a starting point for that discussion. A new costing estimate could consider adding costs associated with stages later down the data value chain, such as dissemination, use, and impact. While the original cost estimates included a provision for staff training in the use of specific instruments, general capacity development investments for these stages of the value chain were not included. Improvements to technical, managerial, communication, and strategic capacity will require additional investment in national statistical systems as will proposed developments of the international statistical system. Inputs to a more comprehensive costing on capacity development could be informed by the needs identified in the recent survey conducted by HLG-PCCB and UNSD.